Pack your bags! Marist is going to Peoria for the IHSA Class 3A STATE Championships! Thomas Leonard QUALIFIES for STATE! Top 7 run career best times! 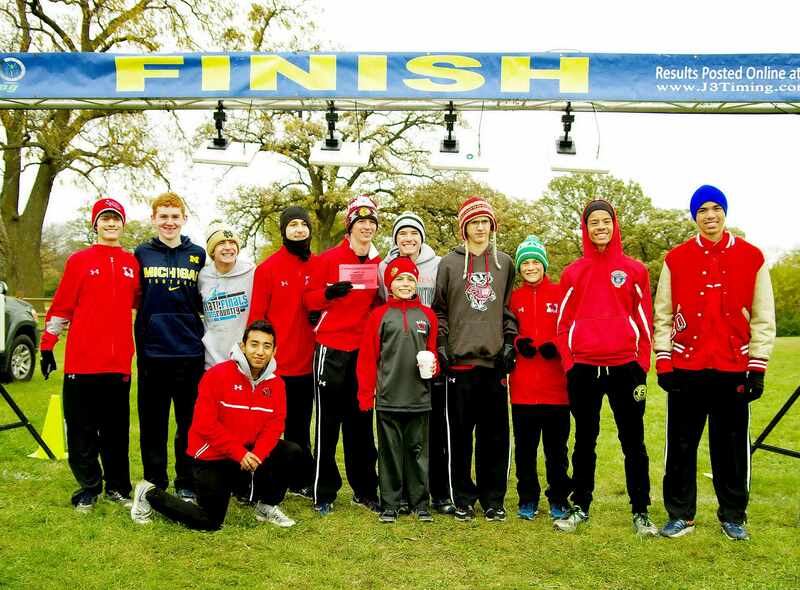 On Saturday, October 27, 2018, Chicago Marist High School hosted the IHSA Class 3A Sectional Championships at Midlothian Meadows Forest Preserve in Midlothian, Illinois. The Marist Varsity Men and Coaching staff would like to thank Marist Principal Larry Tucker, Athletic Director Eric Simpson, Marist Varsity Women Head Coach Pat Quinn, Marist Varsity Women Assistant Coach Rich Karnia, Assistant Athletic Dirctor John O'Connell, Athletic Administrave Assistant Sue Blisk, IHSA Sectional Timer John O'Hara, IHSA Official Kerry Dean, Marist Coach Pat Hogan, Marist Dean Thomas Gouterman, Chris Ironside, and multiple volunteers for all of their help in hosting the 2018 IHSA Sectional Championships, and making this event a huge success. The Marist Varsity Men and Coaching Staff would also like to thank all of the Marist athletes, Alumni legends, parents, friends, and family for cheering on the TEAM to an outstanding IHSA Sectional performance. 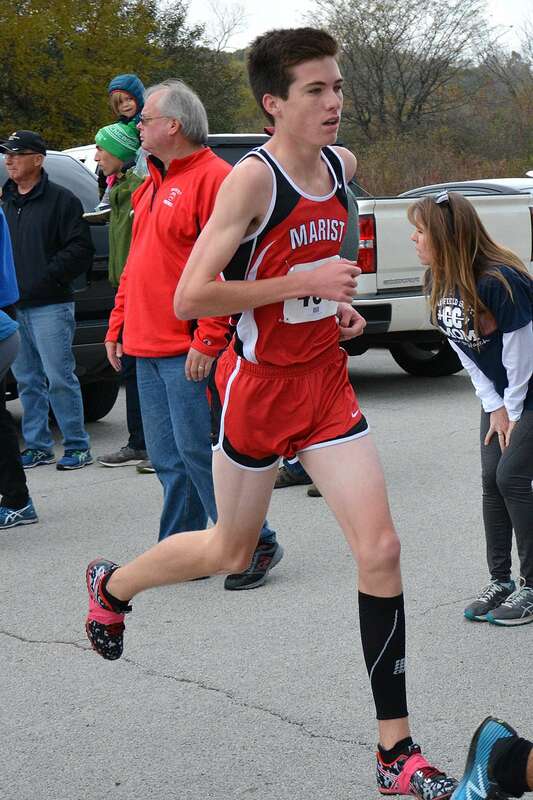 One week after capturing the individual IHSA Regional title, Marist Captain Thomas Leonard QUALIFIED for the IHSA Cross Country STATE Championships by passing 6 runners in the final 800m of the IHSA Sectional Championships to finish in 9th place overall with a personal best time of 15:00.53. In a nice ceremony following the meet, Thomas Leonard was awarded a MEDAL for finishing 9th overall at the IHSA Sectional Championships, and an IHSA Parking Pass for the STATE meet. 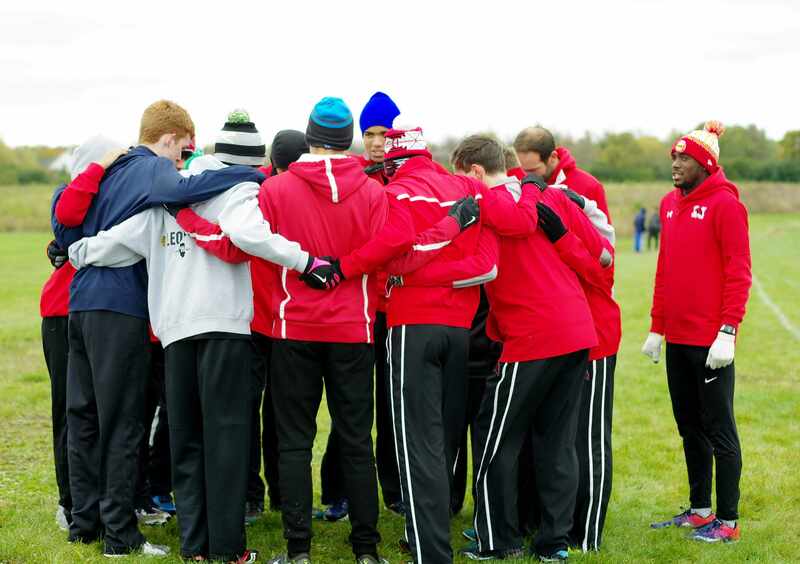 Marist had their best performances of the season, with ALL seven athletes (Thomas Leonard, Lucas Pennix, Colin Tracy, Andres Castillo, Caleb Davis, Brendan Geary, Luke Hortsman) running career best times at the IHSA Sectional Championships! Marist Senior Lucas Pennix finished second for the RedHawks with a personal best time of 16:27.2! Marist Senior Colin Tracy finished third for the RedHawks with a personal best time of 16:40.8! 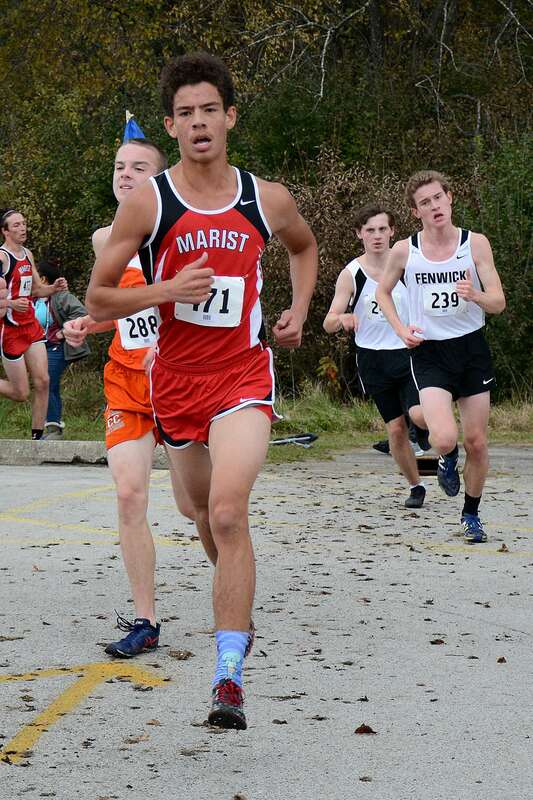 Marist Senior Andres Castillo finished fourth for the RedHawks with a personal best time of 16:55.7! Marist Junior Caleb Davis finished fifth for the RedHawks with a personal best time of 17:16.3! Marist Freshman Brendan Geary finished sixth for the RedHawks with a personal best time of 17:24.7! Marist Junior Luke Hortsman finished seventh for the RedHawks with a personal best time of 17:27! Marist Junior Thomas Leonard leads the RedHawks at the IHSA Sectional Championships with a personal best time of 15 minutes! 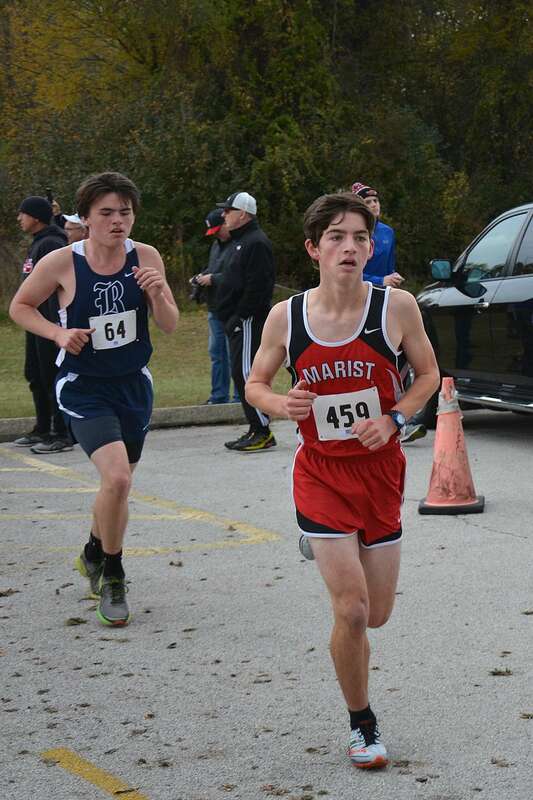 Marist Captain Thomas Leonard ran the first mile in 4:50, and then ran the second mile in 5:14 (10:04), and then ran the final mile in a NEGATIVE split of 4:56.53 to finish in 9th place overall with a personal best time of 15:00.53. 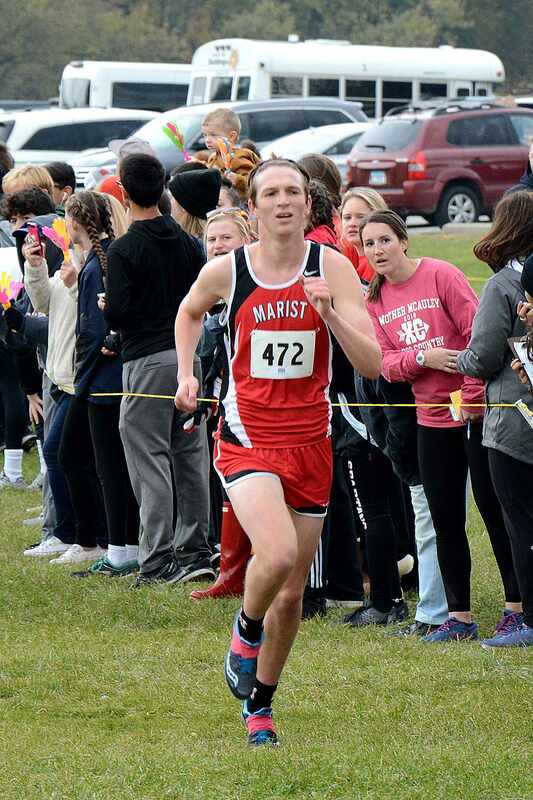 Marist Junior Thomas Leonard QUALIFIED for the IHSA Cross Country Class 3A STATE Championships, and will travel with the Varsity Top 7 to Peoria, Illinois on Friday, November 2, 2018. 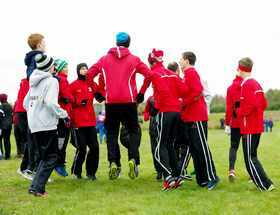 The TEAM will run the STATE meet race course on Friday, before heading to their hotel, and dinner. The IHSA State Championships will take place in Detweiller Park on Saturday, November 3, 2018. In a nice cermony following the meet, Thomas Leonard was awarded a MEDAL for placing 9th overall, and an IHSA Parking Pass for the STATE Championships. 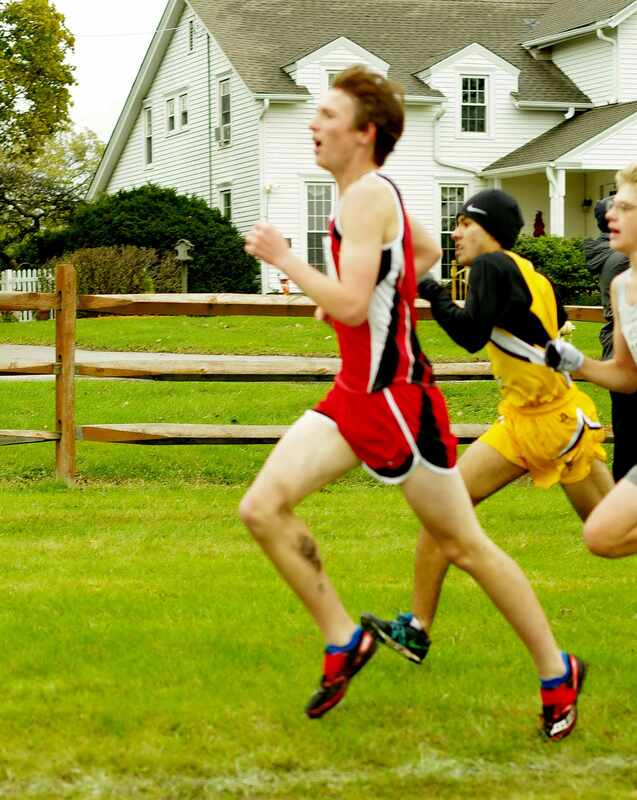 Thomas Leonard is an amazing Team Captain, and the RedHawks most valuable runner. The Marist Top 14 athletes will attend ALL practices this week, and help Thomas Leonard prepare for the IHSA State Championships! 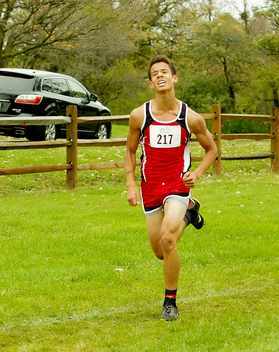 Marist Senior Lucas Pennix finishes second for the RedHawks with a personal best time of 16 minutes and 27 seconds! Lucas Pennix ran the first mile in 5:11, and then ran the second mile in 5:46 (10:57), and then ran the final mile in a NEGATIVE split of 5:30.2 to finish in 9th place overall with a personal best time of 16:27.2. Lucas Pennix has had a great season, including earning Varsity All Conference honors for the second consecutive year at the ESCC Championships! Marist Senior Colin Tracy finishes third for the RedHawks with a personal best time of 16 minutes and 40 seconds! Marist Captain Colin Tracy finished third for the RedHawks with a personal best time of 16:40.8! Senior Colin Tracy ran the first mile in 5:15, and then ran the second mile in 5:44 (10:59), and then ran the final mile in a NEGATIVE split of 5:41.8 for a personal best time of 16:40.8. Colin Tracy has had a great senior year, including earning Varsity All Conference honors at the ESCC Championships. His work ethic, and mental toughness is second to none. He is an outstanding leader for the RedHawks. 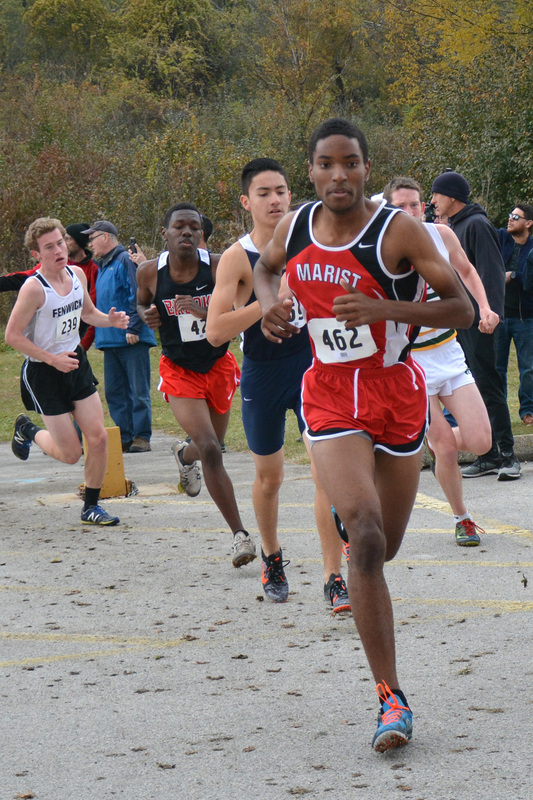 Marist Senior Andres Castillo finishes fourth for the RedHawks with a personal best time of 16 minutes and 55 seconds! Andres Castillo ran the first mile in 5:24, and then ran the second mile in 5:46 (11:10), and then ran the final mile in a NEGATIVE split 5:45.7 for a personal best time of 16:55.7. 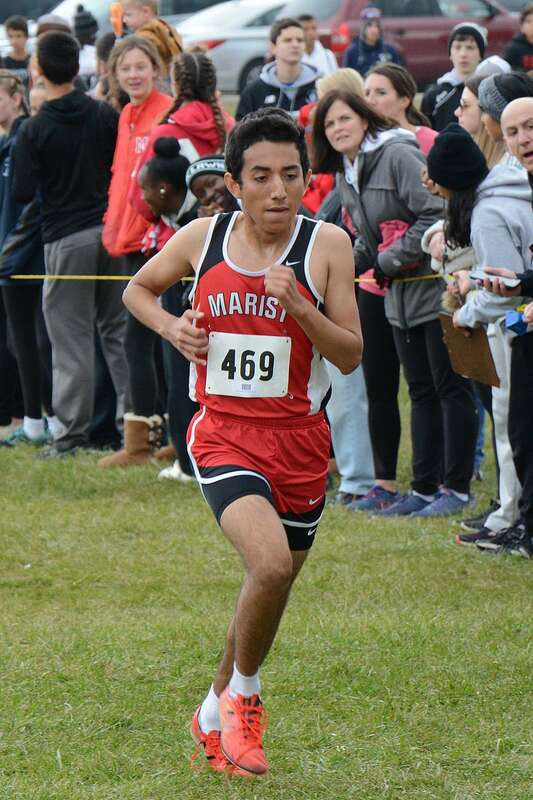 A year ago, Andres Castillo was an alternate for the Varsity, and now he is the fourth fastest runner at Marist High School. Andres Castillo is one of the most improved athletes on the Team. Marist Junior Caleb Davis finishes fifth for the RedHawks with a personal best time of 17 minutes and 16 seconds! Caleb Davis ran the first mile in 5:10, and then ran the second mile in 6:00 (11:10), and then ran the final mile in 6:06.3 for a personal best time of 17:16.3. Caleb Davis has had a great season, including earning Varsity All Conference Honors at the ESCC Championships, and has demonstrated outstanding leadership skills. 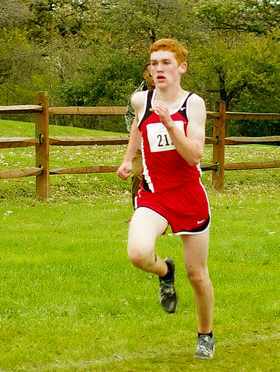 Marist Freshman Brendan Geary finishes sixth for the RedHawks with a personal best time of 17 minutes and 24 seconds! Brendan Geary ran the first mile in 5:34, and then ran the second mile in 6:00 (11:34), and then ran the final mile in a NEGATIVE split of 5:50.7 for a personal best time of 17:24.7! Brendan Geary is a member of the Marist 20 pull-ups club. 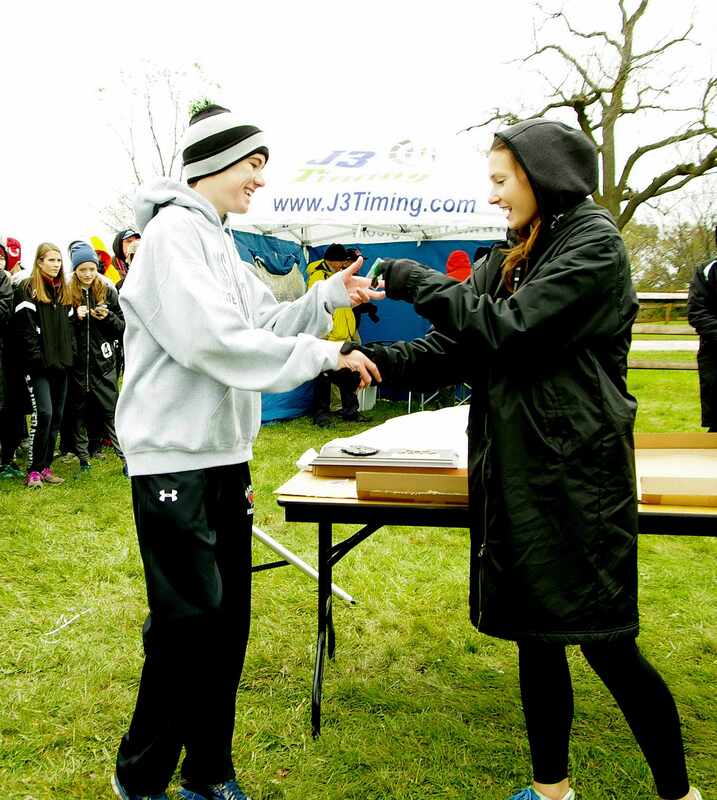 Brendan Geary was the second fastest Freshman at the 2018 IHSA Regional Championships. 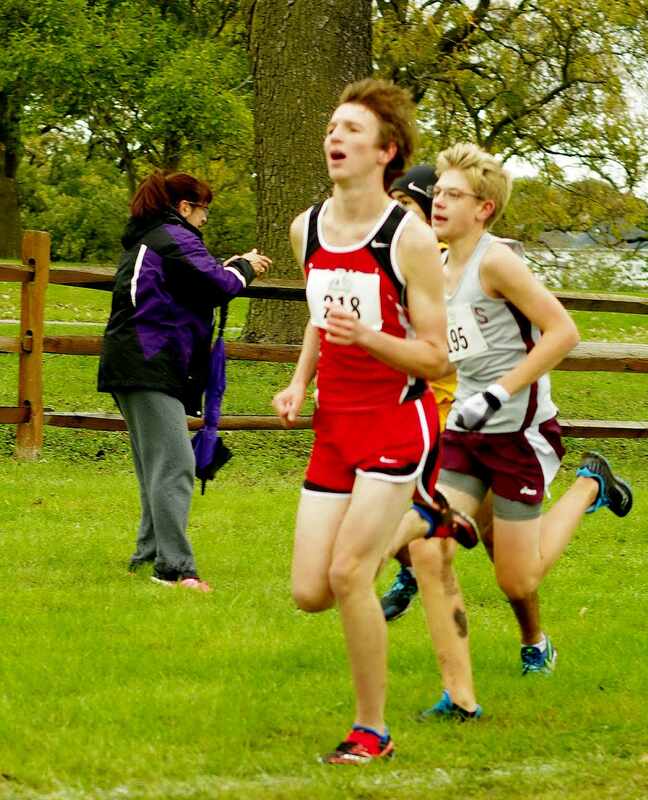 Brendan Geary was the eighth fastest Freshman at the 2018 IHSA Sectional Championships. In his final race of the season, Brendan Geary dropped two minutes and one second from IHSA Regionals (19:25) to IHSA Sectionals (17:24)! 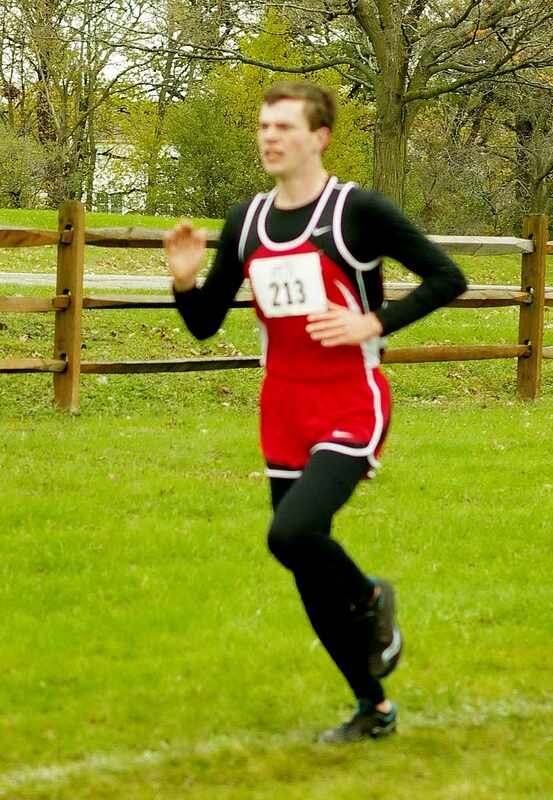 Brendan Geary has been the RedHawks most valuable Freshman runner. Marist Junior Luke Hortsman finishes seventh for the RedHawks with a personal best time of 17 minutes and 27 seconds! Luke Hortsman ran the first mile in 5:32, and then ran the second mile in 6:02 (11:34), and then ran the final mile in a NEGATIVE split of 5:53 for a personal best time of 17:27! 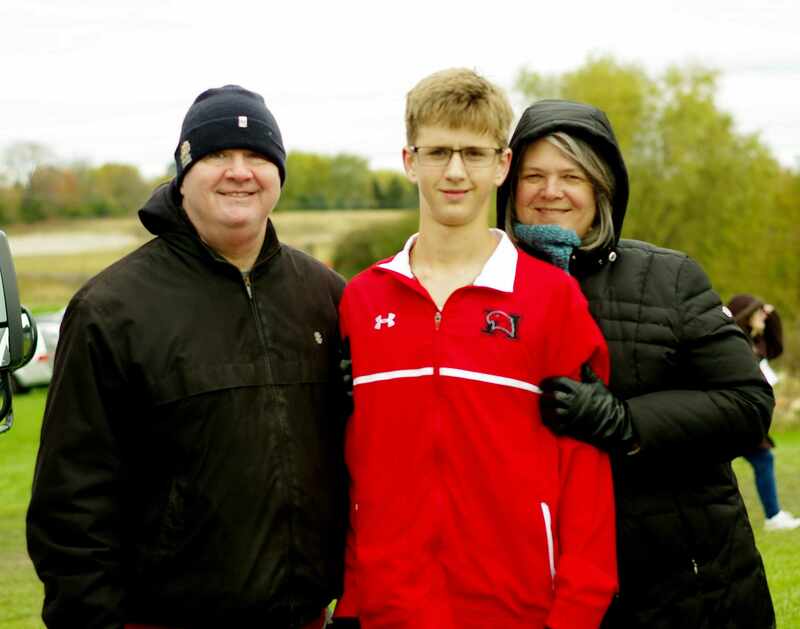 Luke Hortsman has had a great season including earning Varsity All Conference Honors at the ESCC Championships, and has demonstrated outstanding leadership skills. Chicago Marist celebrates qualifying for the IHSA State Championships! Pack your bags!!! Marist is going to Peoria!! Varsity Men QUALIFY for IHSA State Championships!! Thomas Leonard earns a MEDAL by placing 5th overall! CHICAGO - Looking up in the air at the banners hanging from the ceiling at the Marist High School Gymnasium, Marist Head Coach Jon Gordon and Assistant Coaches Phil McNeal and Nick Billone realized something was missing, a banner displaying a Mens IHSA State Cross Country Championship appearance since 1998 -- until now. 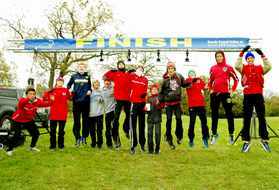 On Saturday, October 28, 2017, the Marist Mens Cross Country TEAM qualified for the IHSA State Championships as a TEAM for the first time in 19 years (1998)! One week ago, Chicago Marist lost by one point to Lemont High School at the IHSA Regional Championships. 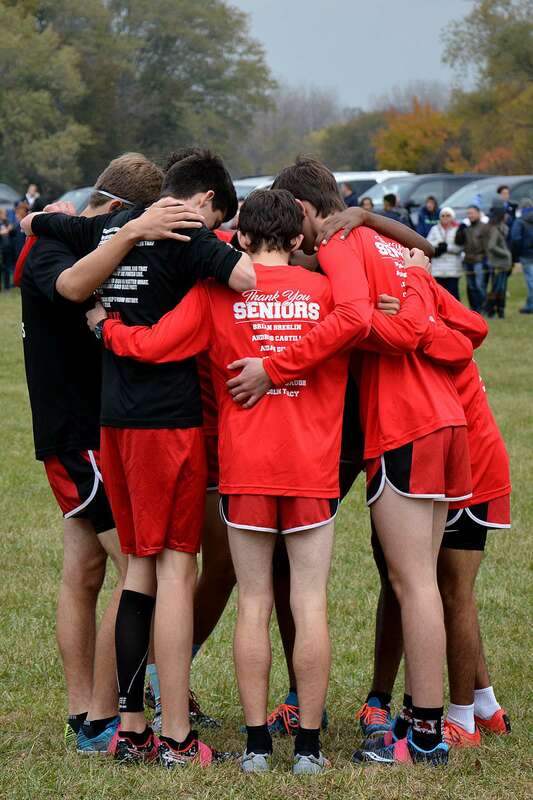 Captain Thomas Leonard (5th), Junior Lucas Pennix (25th), Junior Aidan Dillon (39th), Freshman Kevin Bugos (44th), Captain Colin Tracy (57th), Sophomore Luke Hortsman (62nd), and Junior Joe Donnelly showed more heart and guts than anyone as ever seen at the IHSA Sectional Championships. 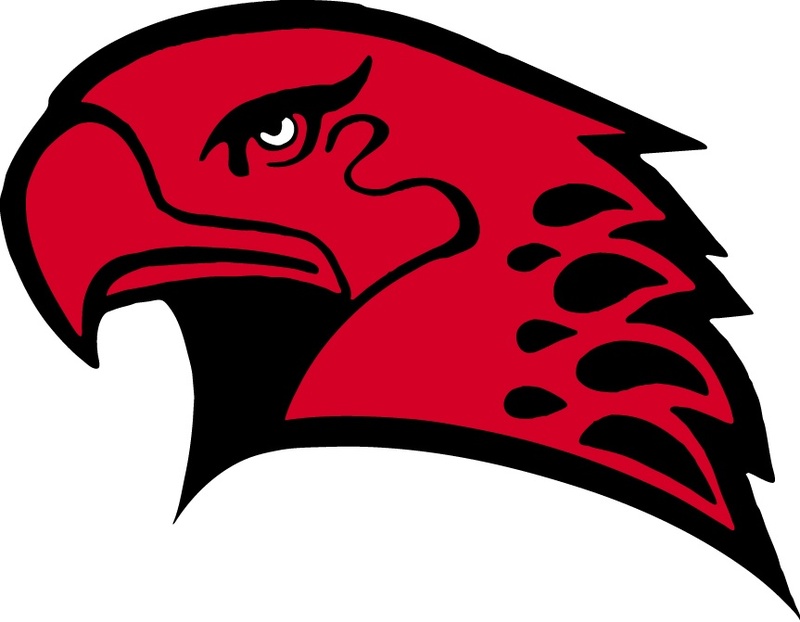 The Chicago Marist Redhawks went from a one point lost to an 83 point victory over Lemont high school, among others, at the IHSA Sectional Championships. The Chicago Marist Varsity Men QUALIFIED for the IHSA State Championships by placing fifth in the IHSA Sectional with a score of 170 points, and posted victories over: 6. Bremen (172 points), 7. Glenbard South (206 points), 8. Providence Catholic (222 points), 9. Thornton Fractional North (229 points), 10. Montini (242 points), 11. Lemont (253 points), 12. Nazareth Academy (258 points), 13. Wheaton Academy (293 points), 14. Evergreen Park (318 points), 15. Richards (353 points), 16. Marian (425 points), 17. Oak Forest (447 points), and 18. Brooks. The Marist Varsity Men had a record of 13-4 on the day! The Marist Varsity Men have been training hard and smart this season. They spent hours in the weight room doing squats and upper body training to prepare for the hilly IHSA Sectional course since August of 2017. The Redhawks ran everday, including weekly trail runs at Forty Acre Woods in the Cook County Forest Preserve and Midlothian Meadows. 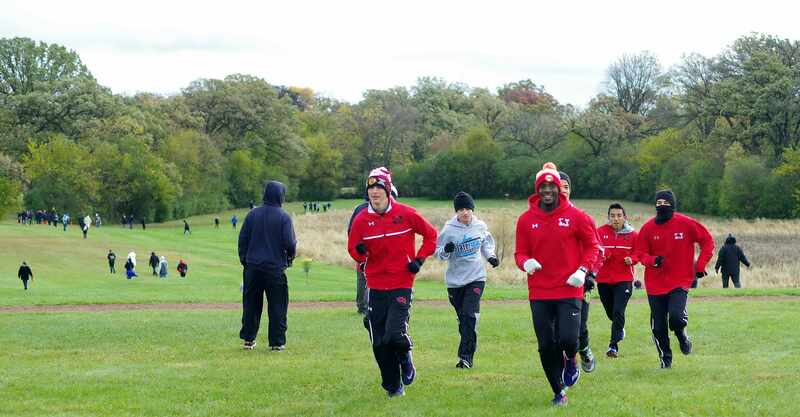 The Team also did Tempo runs on the roads through multiple cities, including Oak Lawn, Mt. Greenwood, Alsip, and Chicago. 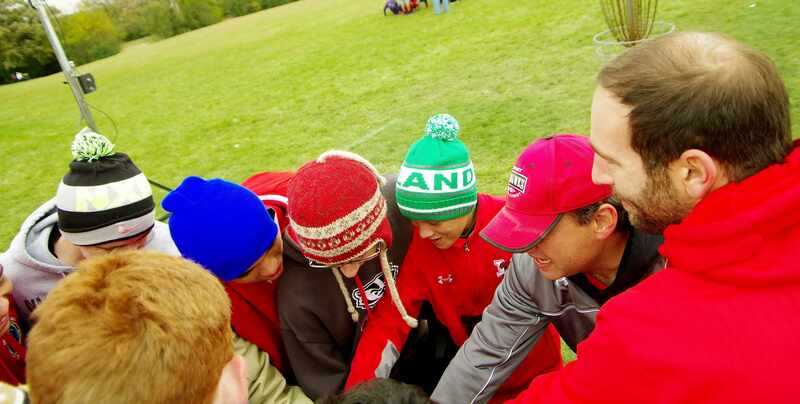 The Coaching Staff put the Team through specialized Track workouts every week at the Marist Track and Field stadium in all weather conditions. Every practice ended in the weight room for strength and core training. 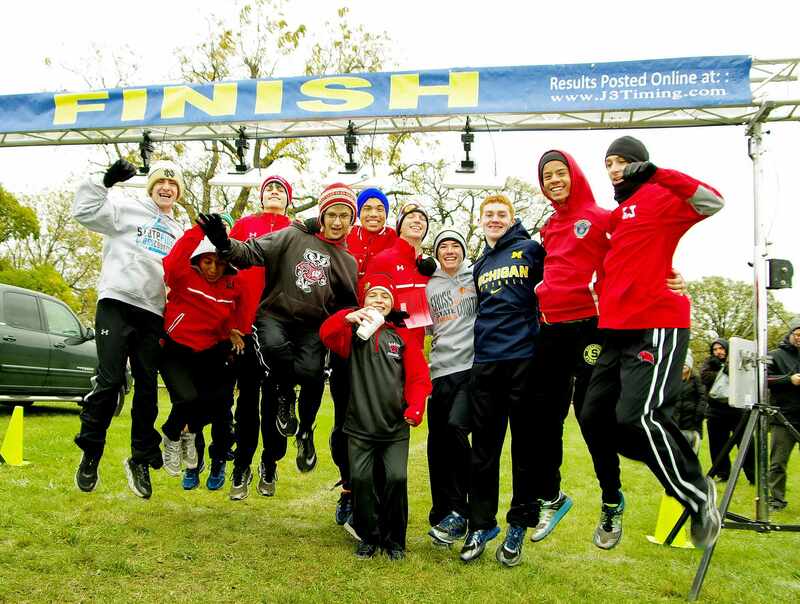 On Saturday, October 28, 2017, the Marist Varsity Men received their REWARD for a season of hard work, by QUALIFYING for the IHSA STATE Cross Country Championships!! The Chicago Marist Cross Country Coaching Staff and athletes have received thousands of congratulations messages from Marist Alumni as far back as 1967! The TEAM will celebrate this week, and will be honored again after STATE on November 12, 2017 at the Marist Cross Country Banquet at the East Bank Club! In preparation for the IHSA State Championships, the Marist Varsity Men will travel to Peoria on Friday, November 3, 2017 to train on the course. The IHSA State Championships will take place on Saturday, November 4, 2017! Chicago Marist celebrates qualifying for STATE! 2017 Chicago Marist IHSA STATE Qualifiers!!! Chicago Marist Top 12 is presented with their Parking Pass for STATE! 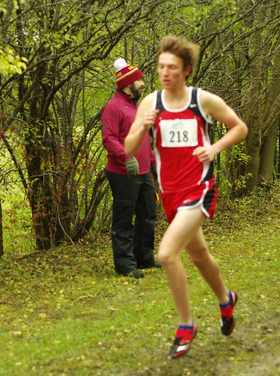 Sophomore Thomas Leonard finishes in fifth place overall to lead the Redhawks at the IHSA Sectional Championships! 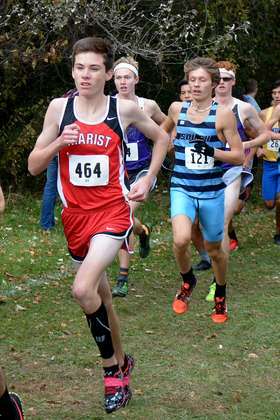 In 2017, Marist Captain Thomas Leonard won the Reavis Rams Invitational (16:02.3), and the ESCC Championships (16:00.9). Leonard also earned All Regional Honors (16:06.7, 2nd place), and a Medal at the Pat Savage Invitational (15:42.6.) Leonard has been the Redhawks most valuable runner. At IHSA Sectionals, to help the TEAM qualify for STATE, the Redhawks needed Leonard in the Top 10, and to finish as far ahead as possible of Lemont's top runner (Junior Andrew Deuschle, 3rd at Marist Regionals) and Midlothian Breman's top runner (Senior Danny Meza, 7th at Thornridge Regionals) to secure vital points for the Redhawks. Prior to the race, temperatures dropped to 38 degrees, with snow, and high winds. In severe weather conditions, Thomas Leonard came through BIG for the TEAM. Sophomore Thomas Leonard ran the first mile in 5:05, and then ran the final two miles in 10:57 on a hilly course to finish in FIFTH place overall with an official time of 16:02.00. 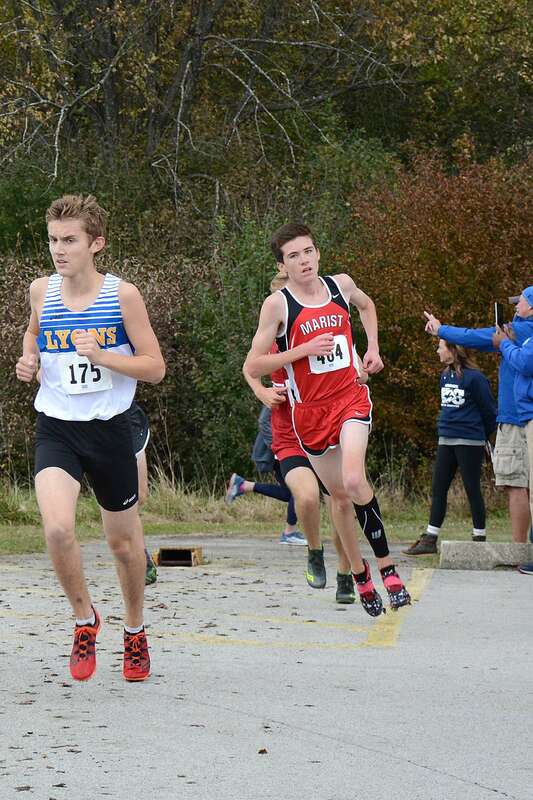 Thomas Leonard was the fastest Sophomore in the Sectional. Lemont Junior Andrew Deuschle finished in 15th place (16:41.7). Deuschle qualified as an individual for the State Championships. 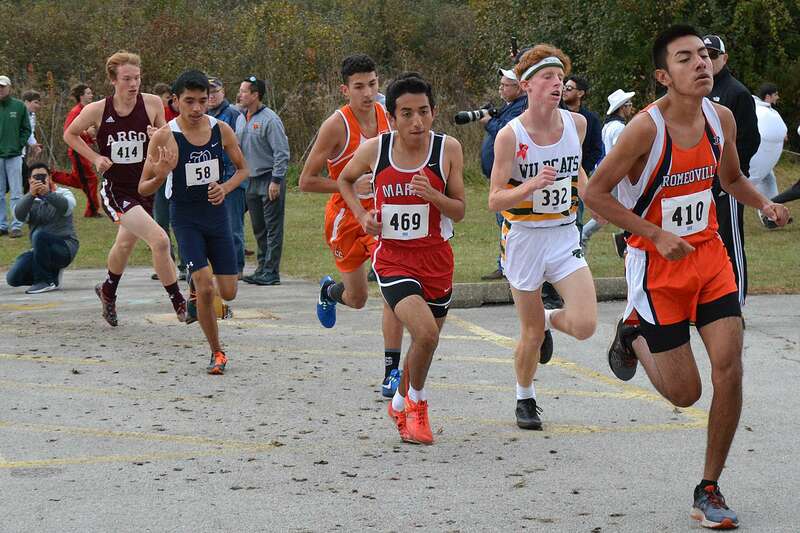 Breman Senior Danny Meza finished in 19th place (16:51) to lead the Braves. 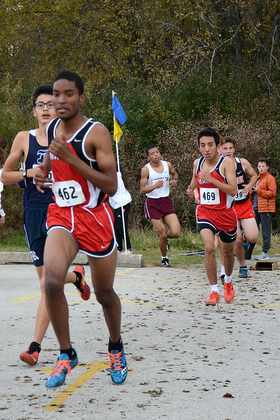 Meza dropped nine seconds from IHSA Regionals (17:00). 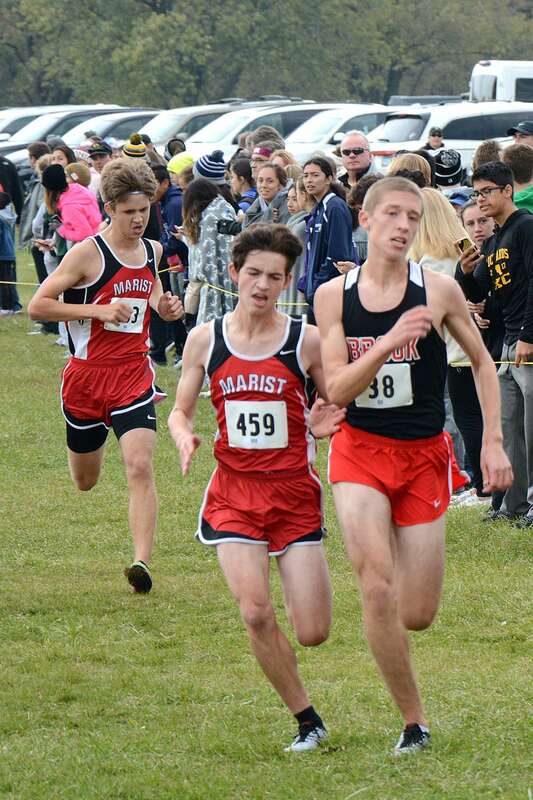 Thomas Leonard's outstanding performance secured vital points for Redhawks, and gave Marist a 10 point lead over Lemont, and a 14 point lead over Breman, after all three schools top runner finished the Sectional race. In a nice ceremony following the meet, Thomas Leonard was awarded a MEDAL for finishing in fifth place overall in the IHSA Wheaton Academy Sectional. Junior Lucas Pennix finishes in 25th place at the IHSA Sectional Championships! 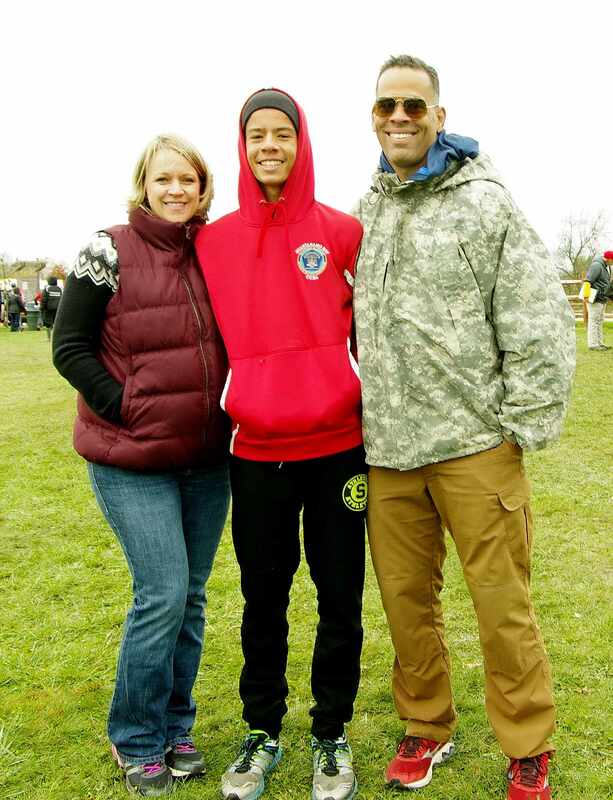 In 2017, among other honors, Marist Junior Lucas Pennix earned All Conference Honors at the ESCC Championships (17:03.8, 17th), All IHSA Regional Honors (17:10.9, 8th), and ran a 16:43.3 at the Pat Savage Invitational. Lucas Pennix has incredible work ethic and mental toughness. 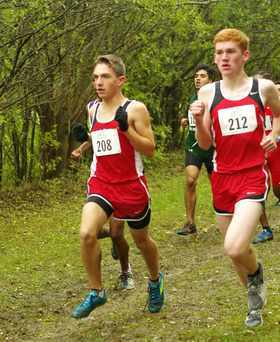 At IHSA Sectionals, to help the TEAM qualify for STATE, the Redhawks needed Pennix to finish ahead of Lemont Senior Ryan Freitag. This would not be an easy task. Freitage finished in sixth place at the IHSA Marist Regional with a 17:04. 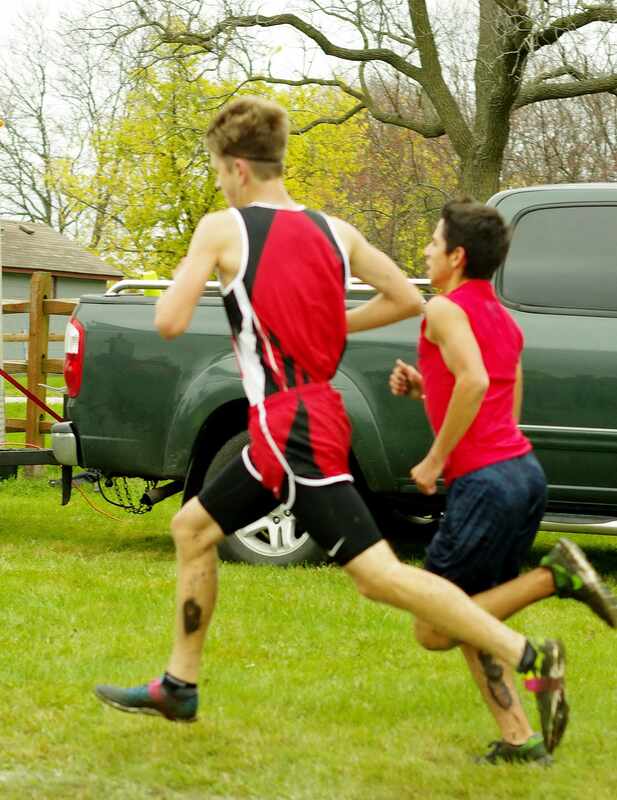 The Redhawks also needed Pennix to finish as far ahead as possible of Breman's second runner (Senior Elijah Trella, 11th at Thornridge Regionals) to secure vital points for the TEAM. In severe weather conditions, Lucas Pennix came through BIG for the TEAM. 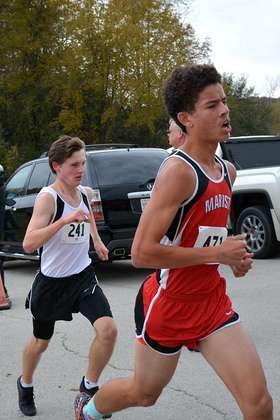 Junior Lucas Pennix ran the first mile in 5:31, and then ran the final two miles in 11:34.2 on a hilly course to finish in 25th place overall with an official time of 17:05.20. Lemont Senior Ryan Freitag finished in 34th place (33rd place for scoring) with an official time of 17:23.0. Breman Senior Elijah Trella finished in 37th place (36th place for scoring) with an official time of 17:26.3. 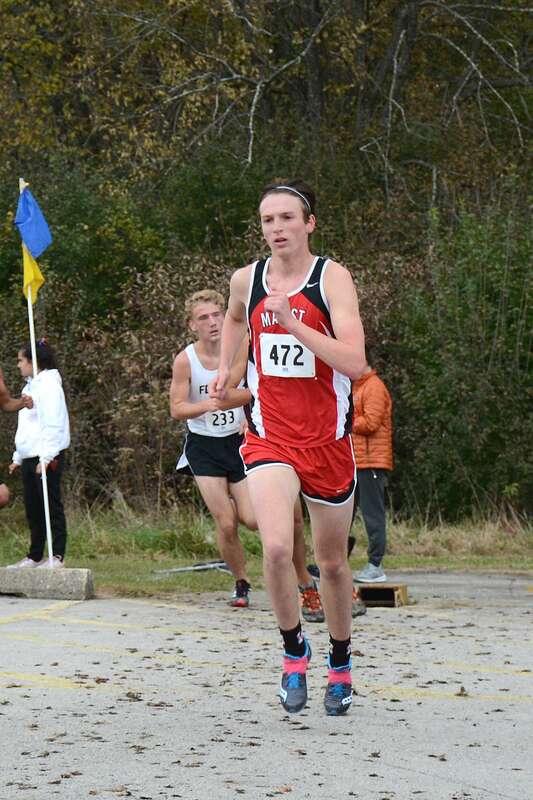 Lucas Pennix's outstanding performance secured vital points for the Redhawks, and gave Marist a 18 point lead over Lemont, and a 25 point lead over Breman, after all three schools second runner finished the sectional race. Junior Aidan Dillon finishes third for the Redhawks and in 40th place overall at IHSA Sectionals! In 2017, Marist Junior Aidan Dillon has dropped time in FOUR consecutive races, including the IHSA Sectional Championships. Aidan Dillon ran a season best time of 18:19.9 at the Pat Savage Invitational on September 30, 2017. Dillon dropped another four seconds at the ESCC Championships (10/14) with an official time of 18:15.1. At the IHSA Regional Championships, Aidan Dillon had a huge race, and dropped another 39 seconds for an outstanding time of 17:36.40. At the IHSA Sectional Championships, Aidan Dillon dropped four more seconds to finish in 40th place overall (39th for Team scoring) with a season best time of 17:32.0. Aidan Dillon ran the first mile in 5:39, and then ran the final two miles in 11:53 for an official time of 17:32.0. Dillon finished 28 places ahead of Lemont's third runner, Junior Lucas Zacek (17:57.6, 68th place) to secure vital points for the TEAM. 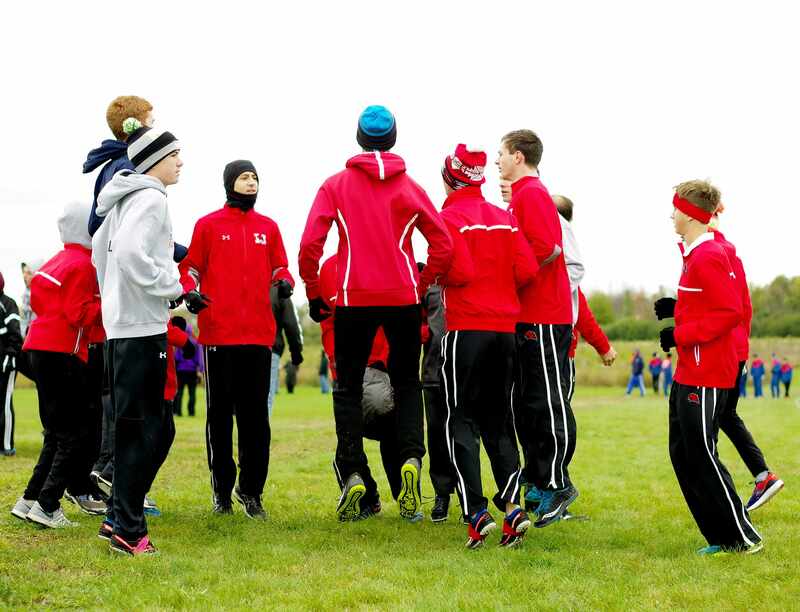 The Redhawks impressively put a total of six runners ahead of Lemont High School's third runner to clinch victory, and make it a two team race for the final advancing spot for the IHSA State Championships. 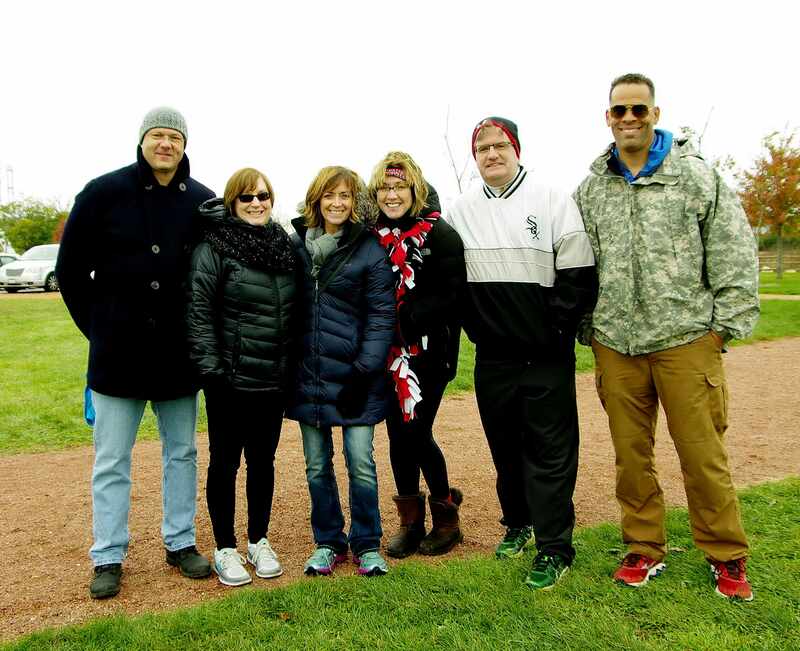 Chicago Marist parents celebrate qualifying for STATE! 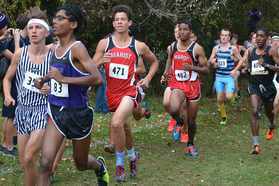 Freshman phenom Kevin Bugos outkicks Marian Catholic Senior Jalen Frazier to finish fourth for the Redhawks and in 45th place overall at Sectionals! In severe weather conditions, Kevin Bugos came through BIG for the TEAM. Freshman Kevin Bugos ran the first mile in 5:39, and then ran the final two miles in 11:55.9 to finish 45th overall (44th for Team Scoring) with a PERSONAL BEST time of 17:34.9. 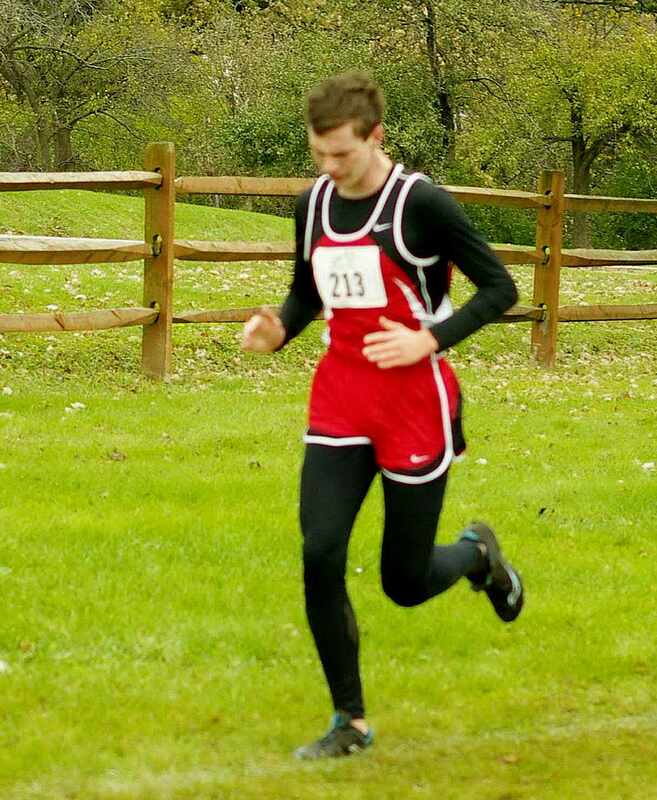 Kevin Bugos dropped 16 seconds (17:50.6) at the IHSA Sectional Championships with a personal best time of 17:34.9. Kevin Bugos also finished 23 places ahead of the third runner from Lemont to secure vital points. 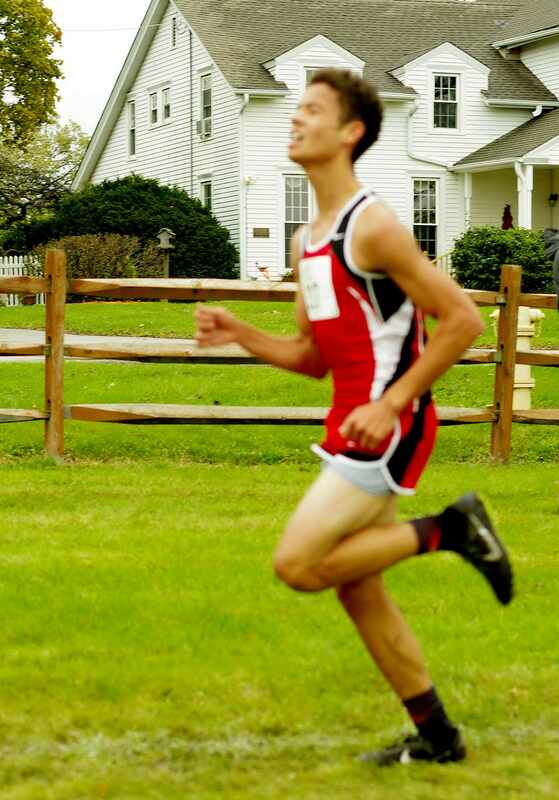 Kevin Bugos is one of the Redhawks most improved runners. His potential is unlimited. 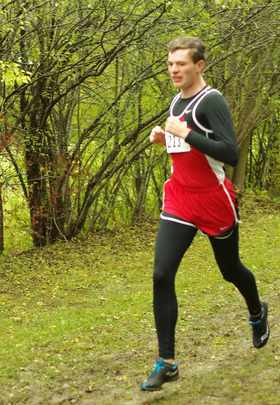 Kevin Bugos also runs his best in the toughest conditions, including a Triple PR at the Conference Championships (17:50.6, 30th) in a thunder storm. 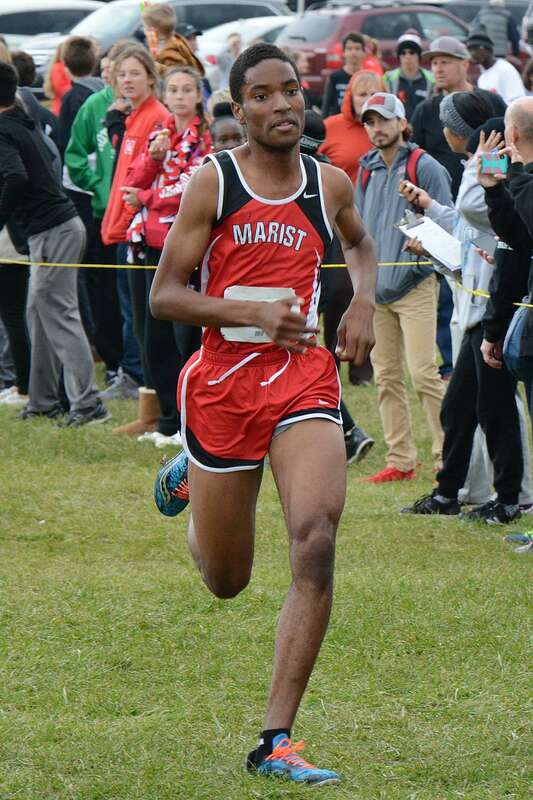 Bugos has been the most valuable freshman athlete at Marist, including recent outstanding performances at IHSA Regionals (17:52.1, 22nd), and the IHSA Sectional Championships (17:34.9). Bugos will excel on the IHSA State Championship course at Detweiller Park in Peoria, Illinois on Saturday, November 4, 2017. Captain Colin Tracy finishes fifth for the Redhawks to complete the scoring and advance Marist to the IHSA State Championships!! 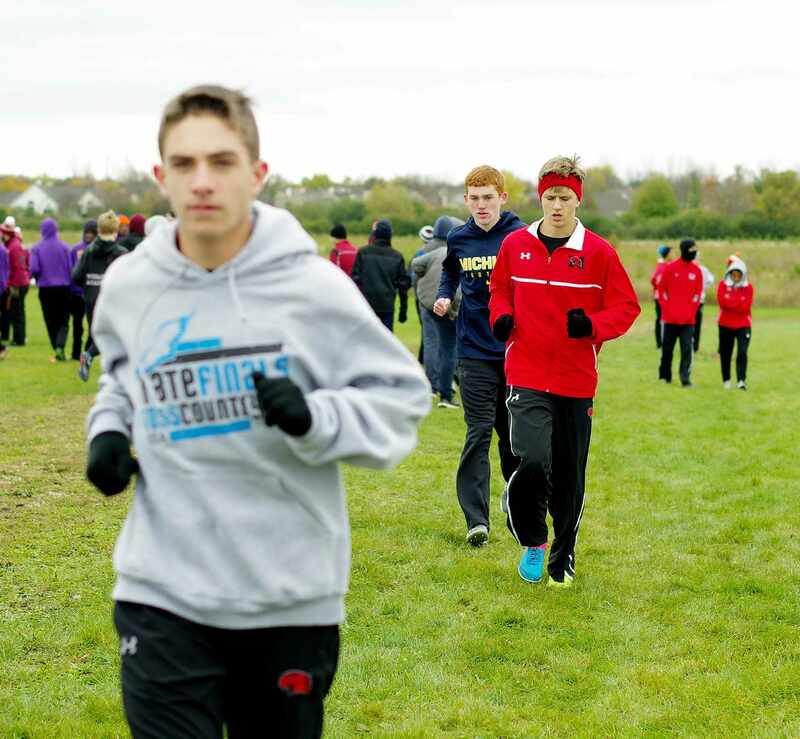 In 2017, among other honors, Captain Colin Tracy earned All Regional Honors by finishing 11th overall at the IHSA Regional Championships (10/21) with an official time of 17:23.8. Tracy also ran a personal best time of 17:09.9 at the Pat Savage Invitational (9/30). Tracy is also a leader in the weight room, and did 35 consecutive pull-ups this season. 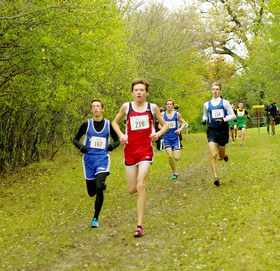 In a Cross Country race, the last athlete that can score in a meet is the fifth runner. The sixth and seventh runner can push opposing Team scores back by finishing ahead of the opposing Teams fifth runner. But the last athlete that can score is the fifth runner. Chicago Marist put six runners in front of Lemont's third runner to clinch victory over the Indians. However, it would come down to the performance of Marist fifth runner to determine if Midlothian Breman or Chicago Marist went to STATE. 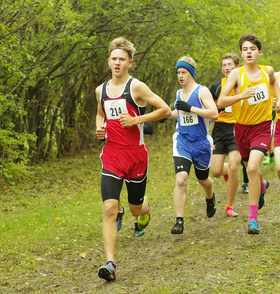 As Junior Colin Tracy came within the final 200 meters of the finish line, he was running toe to toe with Wheaton Academy Sophomore Owen Eldersved, and Providence Junior Nathan Krabbe. 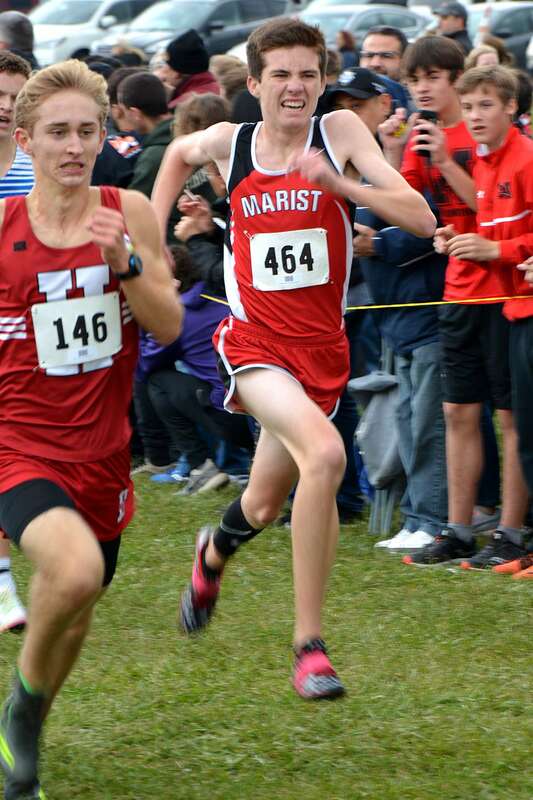 Colin Tracy needed to outkick one of the above athletes to the finish line for Chicago Marist to advance to the IHSA State Championships by one point over Midlothian Breman. The crowd, the coaching staff, the spectators all cheered Tracy to the finish line. 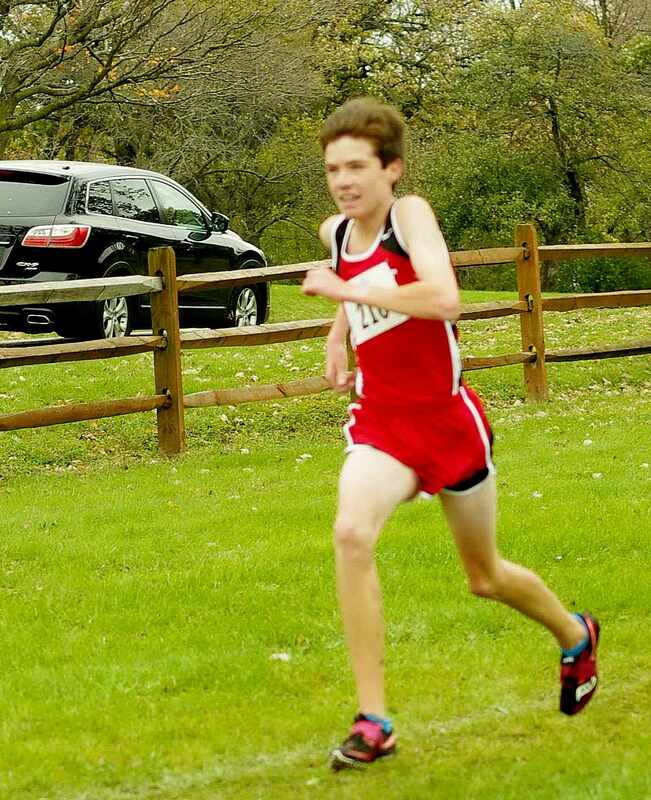 Tracy was focused on every stride, with everything he had left, and in the final strides to the finish line, he outkicked both Wheaton Academy Sophomore Owen Eldersved (17:52.9), and Providence Junior Nathan Krabbe (17:52.9) to finish in 60th place overall (57th for Team Scoring) with an official time of 17:52.5 to send the Redhawks to the IHSA State Championships for the first time in 19 years with a 2 point victory over Midlothian Breman!! Junior Colin Tracy ran the first mile in 5:36, and then ran the final two miles in on the hilly course in 12:16.5, and outkicked two runners to the finish line by 0.4 of a second for an outstanding time of 17:52.5. Captain Colin Tracy's work ethic and mental toughness is outstanding. Sophomore Luke Hortsman finishes sixth for the Redhawks and ahead of the fifth runner from 12 TEAMS to secure victory for Marist! 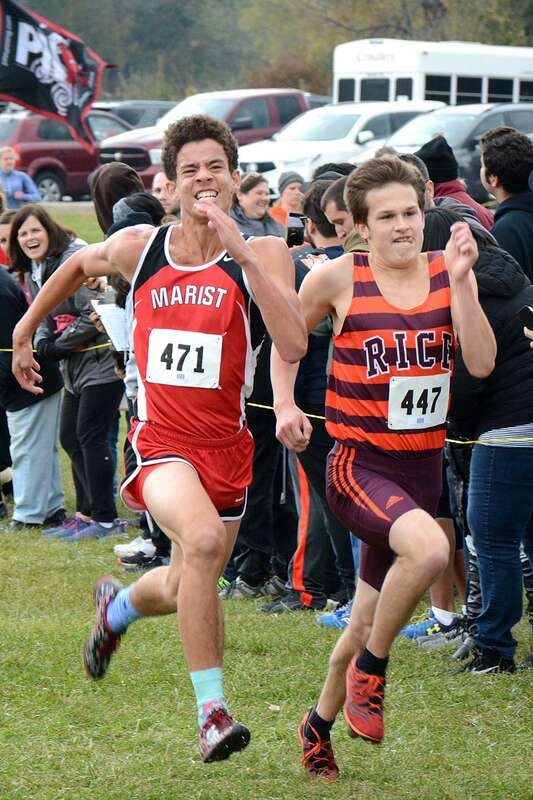 Luke Hortsman outkicks St. Rita Junior Lorenzo Alvarez to the finish line! 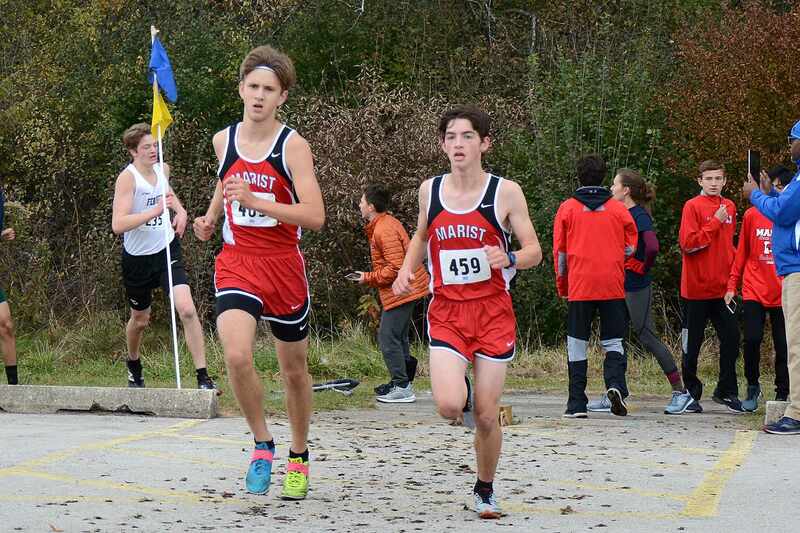 In 2017, Marist Sophomore Luke Hortsman dropped time in THREE consecutive racces, including the Pat Savage Invitational (9/30, 18:26.2), ESCC Championships (10/14, 18:17.7), and the IHSA Regional Championships (10/21, 17:53.1). 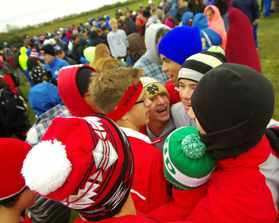 Prior to the IHSA Sectional race, temperatures dropped to 38 degrees, with snow, and high winds. In severe weather conditions, Luke Hortsman came through BIG for the TEAM. Hortsman finished ahead of the third runner (Lucas Zaczek, 17:57.6) from Lemont High School to help eliminate the Indians with an outstanding time of 17:56.3. Luke Hortsman finished in 65th place overall (62nd for Team scoring), and ahead of the fifth runner from 12 TEAMS, including Glenbard South, Providence Catholic, Thornton Fractional North, Montini, Lemont, Nazareth Academy, Wheaton Academy, Evergreen Park, Richards, Marian, Oak Forest, and Brooks to push opposing Teams score back and secure victory for the Redhawks! Luke Hortsman ran the first mile in 5:52, and then ran the final two miles on the hilly course in 12:04.3 for an outstanding time of 17:56.3. 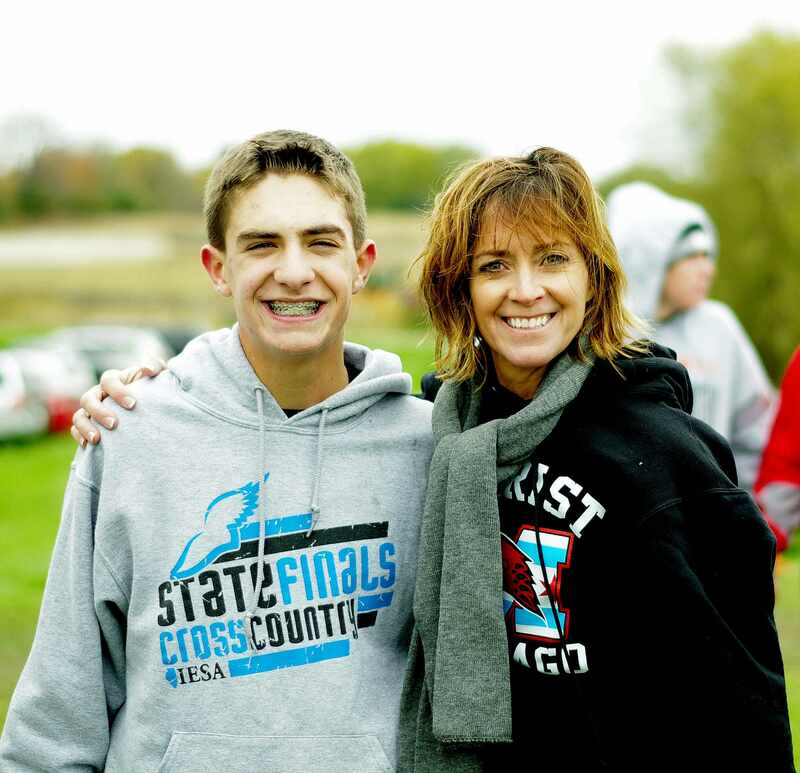 Luke Hortsman will excel on the IHSA State Championship course at Detweiller Park in Peoria, Illinois on Saturday, November 4, 2017. Marist Junior Joe Donnelly earned a Top 7 spot for the IHSA Sectional Championships after running an impressive three mile time trial on the Track in 18:02.00. 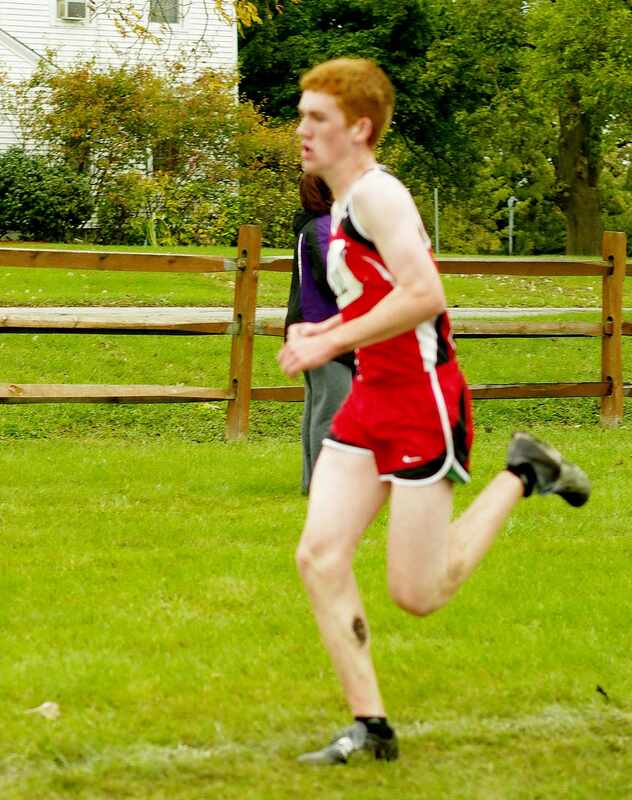 At the IHSA Sectional Championships, Joe Donnelly ran the first mile in 5:55, and then ran the final two miles on the hilly course in 13:10 for an official time of 19:05.00.